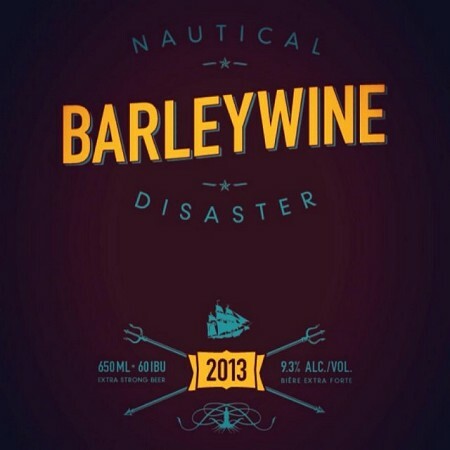 SURREY, BC – Russell Brewing has announced the release of Nautical Disaster Barleywine, a limited edition single batch beer based on a recipe by homebrewer Dave Shea that won the Grand Prize at the 2012 Golden Stag Home Brewing Contest, held last May during Vancouver Craft Beer Week. A heaping dose of four different malts and a 3 hour boil produced a complex and luxuriously rich strong ale with a bitter finish. Good now, and brewed to allow flavours to blend and mellow for years to come. Nautical Disaster Barleywine is limited to 250 cases of 650 ml bottles, and is available now at select specialty liquor stores in British Columbia. This is the second annual Golden Stag collaboration beer from Russell, following last year’s release of 2011’s award winning Russian Imperial Stout developed by Rick August. The series will continue in 2014 with Villicht’s Hochziitsbier Weizen by Jochen Farhr, which took top spot in the 2013 contest held earlier this month.